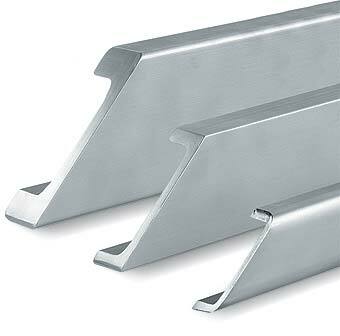 All profiles from Standard 0 on are made from highquality steel UNI FE 510.C Nb, in sandblasted version. 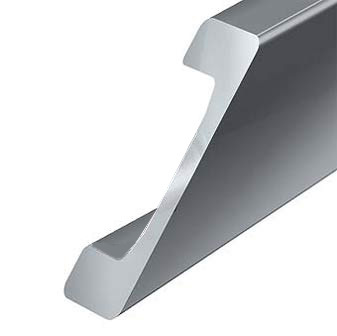 Lmax = 12 m.
To our Combined bearing system, we deliver all profiles in fixed lengths, immediately from stock. All profiles are available in fine straightened style on request. Notice: Yield point 1 is only valid for flange thickness < 16 mm, yield point 2 is only valid for flange thickness > 16 mm. and a more fine grained structure than a conventional Str 52.3 steelgrade. Thus the steelgrade St 52.3 Nb has a better weldability and a higher resistance to brittle fracture. The higher bearing pressure of St 52.3 Nb in comparison to St 52.3 is shown by the figure below.